Former chairman Lee Iacocca gave a closed pep rally to Chrysler employees yesterday in Auburn Hills, once again sharing the stage with a K-car, a minivan...and rumors of Chrysler's imminent bankruptcy. 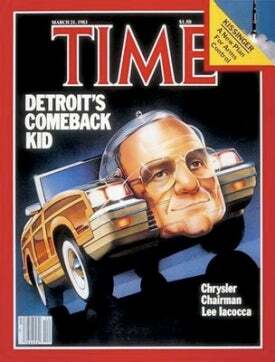 While current CEO Bob Nardelli was praising Iacocca as "Chrysler's most dynamic leader" and "a great American," Chrysler spokesman David Elshoff was telling reporters that rumblings about a forthcoming bankruptcy filing by the automaker were "without merit." Presumably addressing the present state of the industry, Iacocca said, "We'll live through it. Don't panic. Things are going to be OK." To fix the current management problems, Iacocca suggested outfitting Nardelli with wire wheel covers and a vinyl landau roof, then sending him back into the boardroom and hoping everyone would think he was a totally new CEO. The bankruptcy rumors seem to have sprung from reports this week that Chrysler drew down on a line of credit from Daimler. However, under Cerberus' purchase terms, Chrysler had to exercise the credit line before Aug. 3, so there's a "use it or lose it" component to the whole financial story too. Chrysler spokespeople state that the borrowing of $1.5 billion from Daimler and $500 million from Cerberus is not an indication that the company is having cash flow problems, and that Chrysler has $9 billion in cash. Sure sounds good, but all the "categorical denials" and "without merits" pouring out of Auburn Hills don't do much to soothe the nerves.